Incite Group will be organising its various events in 2019 for marketers and brands. The previous events by the Incite Group proved to be a hit and it focuses on more trends in marketing and other fields. The Brand Marketing Summit West is another great event primarily focused on all kinds of brands and marketing strategies. 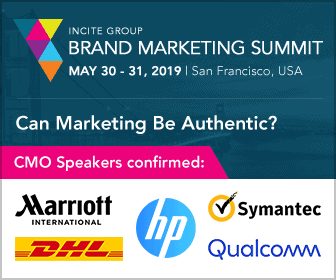 The Brand Marketing Summit West brings together Chief Marketing Officers and marketing leaders from the world’s biggest and most recognisable brands. Custom-built to provide in-house marketing executives with all the skills they need to deliver exceptional marketing, track success, and accelerate their own career. The most beneficial event of the year: benefit from 60 expert speakers, two days of tailored presentations and networking with over 350 other marketing leaders. Exceptional In-House Marketing leaders speak – Be inspired by the very best! Hear from senior marketing leaders at some of the biggest brands and most innovative companies at work today! You’ll get a fantastic opportunity to network with your peers – in-house marketers from major brands: We focus exclusively on the needs of in-house marketers. So that’s who attends! Over 70% of our attendees come from major brands. Register for The Brand Marketing Summit West & Save $250 Now!! Why Should You Attend Blockchain & Bitcoin Conference in Prague?